Home NEWS 30 yr.-old lawyer joins the race for hotly contested CA Speaker’s seat. 30 yr.-old lawyer joins the race for hotly contested CA Speaker’s seat. 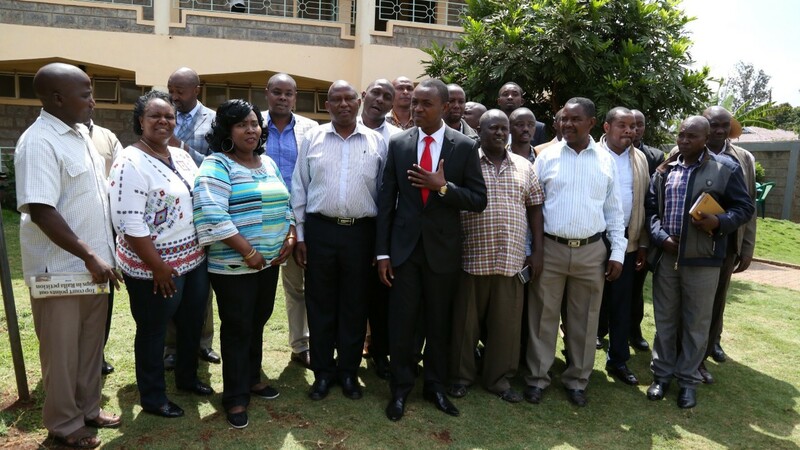 Simon Gikuyu Kamau (centre in a red tie) with MCAs elect for Murang'a County Assembly during a meeting at Golden Palm Hotel in Kenol. 30-year-old Murang’a County Jubilee Chairman Simon Gikuru Kamau has plunged himself into the hotly contested race for the Murang’a County Assembly speaker. The lawyer by profession, joins six other candidates who are eying the same seat. Gikuru declared his bid during a press briefing immediately after meeting all the 35 elected MCAs from the county to lobby for his election. He expressed optimism that he will emerge after what he termed as a ‘successful discussion’ leading to concrete decisions as majority of the MCAs had expressed a lot of goodwill. He however pointed out that there were some of the contenders who had tried to alter the standing orders so that MCAs who nominated any candidate were not be eligible to cast their votes during the elections for the speaker. Gikuru asserted that he is ready to go to court against such clauses which he described as detrimental to natural democratic processes. “The speaker’s position is best suited to someone who very well understands and can interpret the law. A speaker who has close working relationships with MCAs will help the assembly achieve a lot in terms of development and push for bills,” he said. He said that his drive was precipitated by the passion to actualise devolution for the nation to grow. “We want to build and enhance all the structures of the devolved system of government and ensure that the assembly effectively executes its oversight role and so is the executive. That way, there will be mutual respect by both institutions.” said Gikuru. Gakuru will face it off with five other contenders who include the incumbent Nduati Kariuki, Wanjohi Karoga who is a banker, Charles Kihara (lawyer), Daniel Muchoki (lawyer) and Joseph Nyutu (lawyer). The election will be conducted in a secret ballot at a day that is yet to be gazette, next week.